Who doesn't love a sparkly gift? If you are looking for a special gift, you need look no further. Glitter Prosecco & Glitter Champagne, perfect for birthdays, weddings or just because … We create show pieces and all our special glitter Champagne and Prosecco gifts are handmade by us.We can add sparkle to any of our personalised Champagne and personalised Prosecco bottles. See what sparkle we can add to your gift! We use the highest quality glitter and materials for all of our products. Every bottle is hand-made with love and we take great pride in the quality of our beautiful handmade glitter and diamante gem gifts. If you are looking to add Glitz and Glam to your special gift, you need look no further. All our bottles are handcrafted in-house and we take great pride in the quality of our beautiful sparkly bottles. 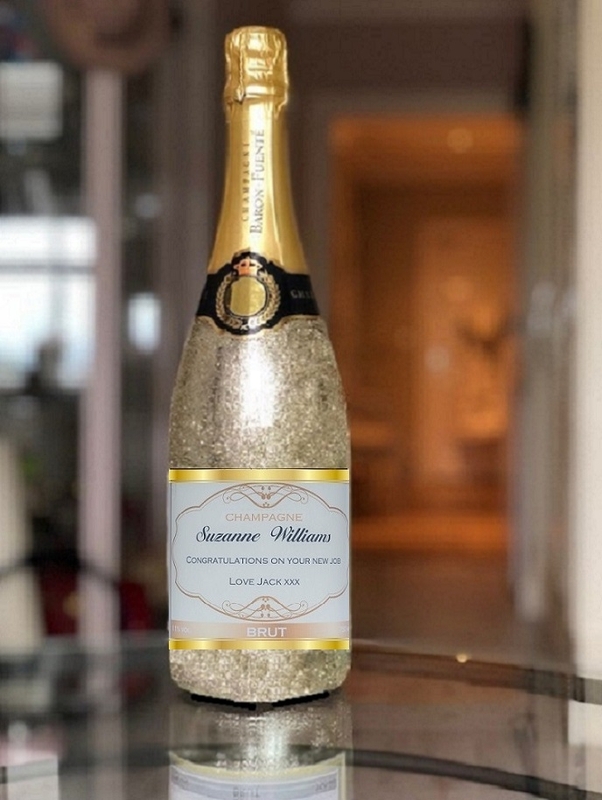 Our Sparkle Glitter Bottles are created using the best quality, very fine glitter which gives a refined, elegant finish. Our team will hand decorate your bottle and the handcrafted glitter is on the outside of the bottle. You will love the look – very special! We have a fine selection of Prosecco and Champagnes to choose from depending on your taste and budget. Once you have made your choice you can then select your label. We have an extensive range of label designs that are exclusive to us. Enter your special message, select your finishing touches and … leave the rest to us! All of our Glitter Bottles are gift wrapped in a luxury clear wrapper and finished with a hand tied bow. We also have a range of luxury gift boxes to add that extra finishing touch. You may choose to add diamantes rather than glitter. It adds that extra bit of sparkle to a bottle of luxury Champagne in a low key way. We will embellish your personalised bottle with crystal gems and rhinestones? We can personalise and glamorise either the label or the bottle, however you like. This eye-catching effect is sure to add that extra bit of sparkle to that special occasion! Choose your Champagne or Prosecco and personalise your own special label which can include name message and/or photograph. Then select “Finishing Touches” and choose “Glitter” or “Diamante Gems” and we will do the rest. Your bottle will look stunning embellished with our Swarovski inspire gems or shimmering with glitter. Together with our gorgeous array of coloured ribbons, bows and paper, we can decorate your Champagne gift any way you see fit. 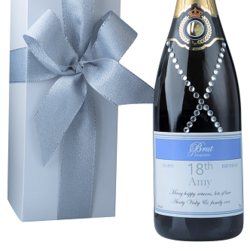 We aim to create the perfect bespoke sparkling gift and all of our gifts are beautifully presented. Each bottle comes in a clear wrapper with hand-tied bow and you can also choose to have yoru gift wrapped by us. We take commissions for personalised orders with glitter - please contact us directly. We hope you enjoy our selection of dazzling personalised Prosecco gifts beautifully decorated with diamantes. 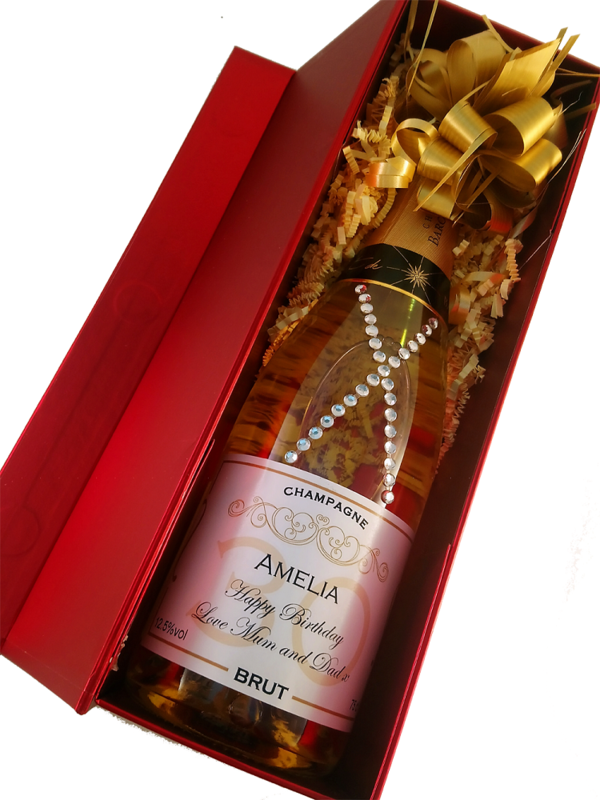 Decorate your personalised Prosecco or Champagne bottle with stunning crystal gems. The glamorous glitz bottles look stunning and make beautiful statement gifts. Any of our gifts can be personalised with crystal gems just select crystals in our "Finishing Touches" before checkout and we will do the rest! ALL our personalised Prosecco gifts are beautifully presented but a touch of sparkle or "bling" really makes your gift extra special.